When you're measuring the value of economy assets, one of the most important metrics is the break-even time: how many turns does this need to survive to pay off? Here are some examples. Assuming you rez them at the end of the runner's turn, PAD Campaign and Adonis Campaign both put you one credit down. The next turn, you've recovered the rez cost of the PAD and are 2 up with the Adonis. In contrast, Eve Campaign puts you three credits down, and takes another two turns to over the rez cost. If they don't immediately trash it, Sundew breaks even on the first turn it's out. And so on. In practice, most economy assets don't pay out unless the runner leaves them alone for at least a turn or two. The cards which do offer positive returns immediately (Mental Health Clinic, Launch Campaign, and Expo Grid) tend to have notable disadvantages: increasing hand size, low trash cost, or an additional trigger requirement. 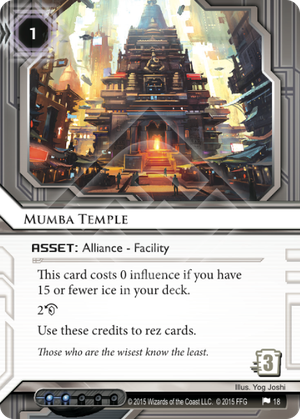 But then there is Mumba Temple. The very first time you rez it, you're one credit up. No tempo hit, no drawback, no tricky trigger requirement. And then, if it stays rezzed, you effectively get another 2 a turn forever, as you rez ice, assets, and upgrades. You can even use it to reduce the tempo hit on PAD or Adonis Campaigns. Of course, you have to decide between paying 2 influence for each copy, or capping yourself at 15 ice. Fifteen ice is not quite enough for a heavy glacier build, but for any sort of horizontal deck (Whitetree, NEH, Gagarin) that's more than enough. And honestly, this card is good enough that it's worth 2 influence apiece anyway.